WASHINGTON — Wisconsin could very well be the state that decides the 2020 election, and the battleground gets a test run on Tuesday. The statewide April 2 race for Supreme Court pits Dem-backed Lisa Neubauer versus GOP-backed Brian Hagedorn. And it's followed a familiar script: Neubauer and her allies have attacked Hagedorn for holding anti-LGBT views, while Hagedorn has accused his opponent of being beholden to liberal interests. Worth noting: Democrats' decisive statewide Supreme Court victory in April 2018 helped foreshadow Tony Evers' 1-point gubernatorial victory over GOP Gov. Scott Walker seven months later, as well as Democratic Sen. Tammy Baldwin's 11-point win. 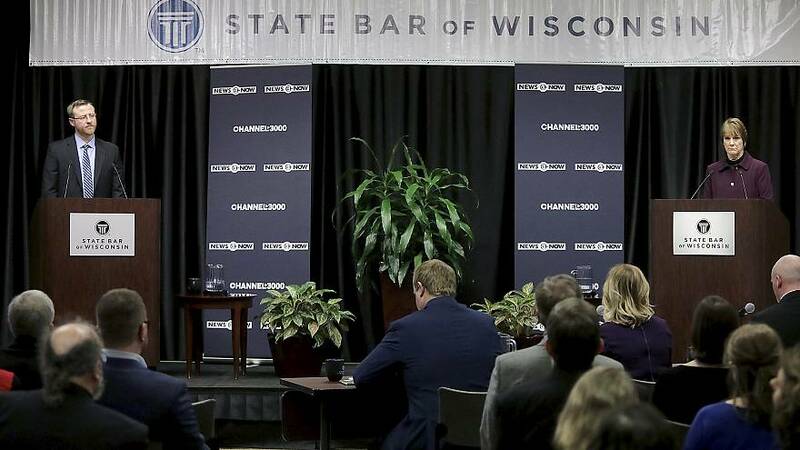 So get ready for lots of talk about Wisconsin over the next 20 months — the Democratic convention in Milwaukee, the 2020 general election contest, and even Tuesday's state Supreme Court race. "Weeks" before the full Mueller report comes out? Attorney General William Barr will release a version of Robert Mueller's report in "weeks not months," a Justice Department official said on Tuesday, per NBC's Julia Ainsley. The official adds: There are no plans to give a copy of the report to the White House in advance of the public release. But why didn't Barr say this earlier — that it would be weeks before the public got its hands on a redacted report? "I am reviewing the report and anticipate that I may be in a position to advise you of the Special Counsel's principal conclusions as soon as this weekend." "Separately, I intend to consult with Deputy Attorney General Rosenstein and Special Counsel Mueller to determine what other information from the report can be released to Congress and the public consistent with the law." Comey says Mueller's obstruction call is "really confusing"
Meanwhile, at a speech in North Carolina, former FBI director James Comey said he's scratching his head over why Mueller left the question of obstruction of justice unresolved in his report. He said: "I have great faith in Bob Mueller, but I just can't tell from the letter why didn't he decide these questions when the entire rationale for a special counsel is to make sure the politicals aren't making the key charging decisions." And this: "The notion that obstruction cases are somehow undermined by the absence of proof of an underlying crime, that is not my experience in 40 years of doing this nor is it the Department of Justice's tradition. Obstruction crimes matter without regard to what you prove about the underlying crime." Programming note: Lester Holt will have an exclusive interview with Comey Wednesday on NBC Nightly News at 6:30 p.m. ET/5:30 p.m. CT.
At an event last night, Joe Biden said Anita Hill shouldn't have had to face "a bunch of white guys" as she testified about her allegations of sexual harassment against former boss Clarence Thomas in 1991. And here's how he phrased his regrets about Hill: "To this day I regret I couldn't come up with a way to give her the kind of hearing she deserved … I wish I could have done something." As our own Mike Memoli points out, it's not the first time that Biden has expressed regret about Hill's treatment in the last year. He told Craig Melvin last September that "I'm sorry I couldn't have stopped the kind of attacks" she faced. And he told Pod Save America last March that "I wish I had been more vocal about" addressing "inappropriate" questions from other lawmakers. But, considering that he was the chairman of the committee at the time, will it be enough to say "I wish I could have done something"? Or do progressive voters want to hear more regret from Biden about what he SHOULD have done? Former Massachusetts Gov. Bill Weld remains in New Hampshire. That's the difference between the share of Americans who say a single-payer-style, federal government-run Medicare-for-All plan is a GOOD idea (43 percent) and the share who say it's a BAD idea (45 percent), according to a new Quinnipiac poll. What's more, that's down from a net 13 in favor of the plan last August. While a single-payer style plan appears to be losing what was once a fairly robust public opinion advantage, the idea of a Medicare buy-in is significantly more popular. In the same poll, 51 percent said it's a good idea to KEEP the current health care system but allow all adults the option to buy in to Medicare. Just 30 percent called that a bad idea. Don't miss the pod from yesterday, when we looked at the poll data behind why the Trump administration's new legal strategy to gut Obamacare has us scratching our heads. The Trump administration is all in on gutting Obamacare. But DOJ's latest move was made against the objections of both the attorney general and the HHS secretary. George Conway writes in a new op-ed that Trump is "unfit for office." The decision by the Cook County state's attorney to drop charges against Jussie Smollett is roiling Chicago politics. Barbara Bush is blaming Donald Trump for her heart attack — and for driving her away from the GOP. Trump is complaining — again — that Puerto Rico is getting too much hurricane relief funding. Trump is heading to California soon for 2020 fundraising. What the heck is going on with Trump's new health care talk? Betsy DeVos is facing some rough questioning over proposed cuts to Special Olympics funding. The Trump travel ban is facing new legal challenges. Beto O'Rourke is introducing himself to black voters in South Carolina. Top 2020 Dems are headed to Las Vegas next month for a labor conference. The New York Times has a deep dive into Cory Booker's criminal justice record. Pete Buttigieg is weighing in on … Chick-fil-A's chicken. Ben Ray Lujan is expected to run for Senate In New Mexico.